Building information modeling (BIM) should be high on facilities managers’ agendas, but data shows that not enough facilities managers are leveraging it to its fullest capabilities. Why? Most likely because of uncertainty around how they can benefit and what implementing it requires. There are also 4D and 5D options that can render digital visual representations of time, schedules and costs. Since BIMs are live models, they recognize changing relationships between objects, giving users a way to play with facilities and assets digitally. When this technology is incorporated with a facilities management software platform, users are able to access constantly-updating profiles filled with key data about buildings and the assets in them. Now that BIM is mandatory on UK public sector projects, it will start gaining even more momentum across the globe. Therefore, it’s vital that FMs learn how to implement and engage with this revolutionary technology to stay competitive. CAD, or computer-aided design, is a wide category of 3D modeling software primarily used in engineering— designing parts, tools or large projects like bridges. BIM, on the other hand, integrates both 2D and 3D modeling tools and falls underneath the CAD umbrella. BIM is supported by a single computer system instead of multiple tools and documents, thereby consolidating collaborative processes. This level of collaboration is highly valuable for facilities management, which involves coordinating and communicating across multiple locations and teams. Cost Savings: By allowing buildings to be constructed virtually before they’re built physically, updates can be made and mistakes can be rectified without the expense of doing so with heavy, pricey materials. This also results in cost certainty during building and management. Improved Efficiency: Due to the enhanced collaboration BIM enables, mistakes and duplicates are avoided and FM processes can progress smoothly. Greater Safety: Experiment with building design to create safer, more secure facilities. For example, you can input crowd behavior data to optimize fire escape routes, or move security camera placements around to determine how to monitor the greatest area. Increased Proactivity: BIMs provide certainty, allowing you to develop a comprehensive, clear, intelligent FM plan before you take physical action. This means that operations, when they begin, are intentional and highly productive. Yes, BIM is a useful tool for building architects, but they are far from the only ones able to leverage it for exceptional results. 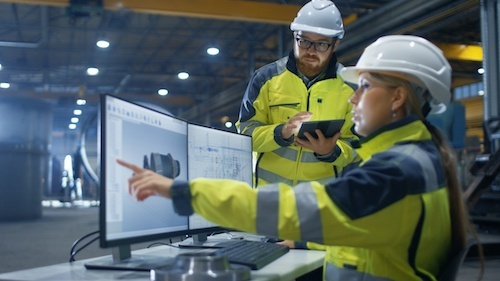 Data like building blueprints and equipment information is incredibly valuable for tasks like asset tracking, space planning and budgeting, which extend into facilities managers’ responsibilities. As an FM, use BIM integrated with facilities management software to track and virtually display asset information including cost, location, service history, serial number, warranty, energy use and emissions. This helps you effectively organize this key data; use it to make informed FM decisions like asset repair versus replacement. The result is quickly diagnosed FM issues and accurate performance predictions, leading to fewer failures. Additionally, contractors can use integrated BIM and FM software to see 3D representations of the assets they need to repair, as well as their locations, maintenance histories and contract information. This improves contractor efficiency and increases first-time resolutions. Indeed, the design stage is a crucial time to leverage BIM’s capabilities; determining what buildings will look like, where assets will live, and how space will flow can be streamlined and enhanced with digital renderings. Your facilities team’s involvement at this stage can also impact what your FM processes will look like throughout buildings’ lifespans. Keep in mind that, since it goes beyond 3D modeling to also function as information management software, BIMs include metadata that you can leverage to optimize workflows, enable cross-departmental collaboration, and improve repair and maintenance processes far past the building design phase. Use BIM to collect, store, integrate and analyze facilities data seamlessly throughout FM processes. Then you can make informed decisions across building lifecycles around space planning, asset management, sustainability, efficiency and budgeting. Proper facilities management involves handling an incredible amount of data, ranging from asset information to contractor performance metrics to spend and revenue numbers. BIM and FM software help store and organize all this data in an actionable manner, supporting intelligent decision-making, business-wide clarity, and better business outcomes. Perhaps most vitally, it also promotes improved collaboration across multi-site facilities and globally-based teams. BIM is only in the beginning stages of FM process integration; the future looks incredibly bright as this technology advances and specializes even further. Learn more about integrating innovative facilities management technology into your FM processes.